Not long ago, I had the pleasure to talk with Micheal Felix and Emily Wormley. Michael gave a presentation for the Curiosity Club at Hand-Eye Supply store in Portland. Michael makes some things that can be seen here http://effalo.com/ and I especially love http://makerfactory.com/ an awesome model of crowd sourced production that is pretty much applicable in all fields and industries. Emily makes stuff, some of her projects can be seen at http://emilywormley.com/, amazing moving images are a small example of her creative powers. I’ve run into Jim Hill on various occasions around town. I was pretty excited when I saw his project on kickstarter and thought he would be a great person to talk with. The Dead Don’t Die is a zombie western graphic novel that Jim is working on as part of his thesis at PNCA. I spoke with Jim on the edge of the Pearl a section of town in NW Portland. Now the following videos are the conversations I had with Jim, the first introduction is kind of an interesting first attempt, the idea was that we would walk and simply make our way through a small crack in a locked fence as if it was no big deal. Things didn’t quite work out that way and had zombies been chasing Jim and I… Well let’s just say, he probably wouldn’t have survived an attack. I encourage you to help fund his project, he’s offering some super sweet incentives for people that pledge and I know he could certainly use way more financial support than he’s asking for. And here’s a map of our walk. 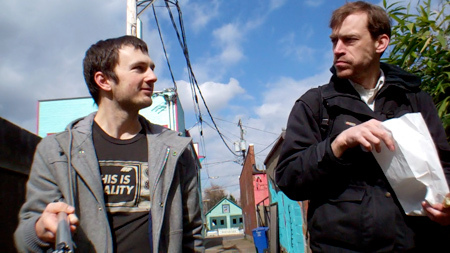 I had the pleasure to chat with Urban Scout (aka Peter Bauer) for a number of hours yesterday. He runs a non-profit, writes a blog, has a book he just published. Check out his book on his site and help fund his book tour on Kickstarter. I could write for a while about Urban Scout for a while but, I think the videos are far more entertaining and also nature is calling. You know that feeling you get when you sit down and watch a few really good TED talks in a row? That’s my feeling after conversations with ReadWriteWeb’s Marshal Kirkpatrick. Foursquare informed me that he was only a few blocks away and I knew this was my opportunity to grab a little quality time with Marshall. 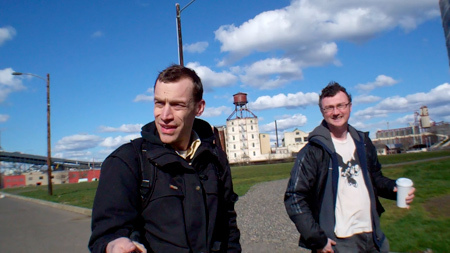 Check out the video below as Marshall and I have a nice conversation while exploring Portland’s Old Town/China Town. And a map of our walk. 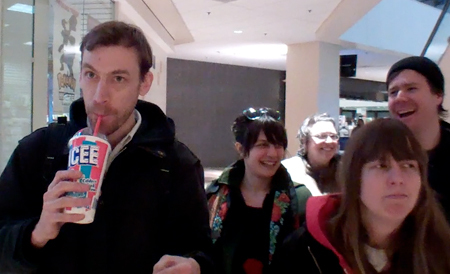 After talking with Khris Soden yesterday I ventured up to the Lloyd Center mall to do some shopping at Hot Topic and to just, you know, hang out. While chillin’ in the food court I ran into the majority of the hosts of my favorite radio show of all time Life During Wartime on KBOO. It was a real treat run into them there and I was very fortunate that they had a few minutes to talk with me. I’ve never done a four person interview with this many people before. 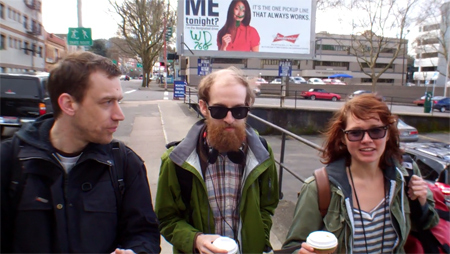 Khris Soden is a Portland historian, artist and pedestrian. He has contributed a lot of work to MoHDI in the past and a long time friend. 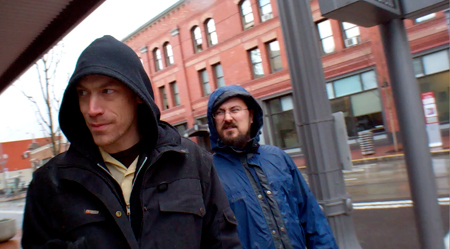 I was fortunate to get a couple short conversations with him after running into him downtown. 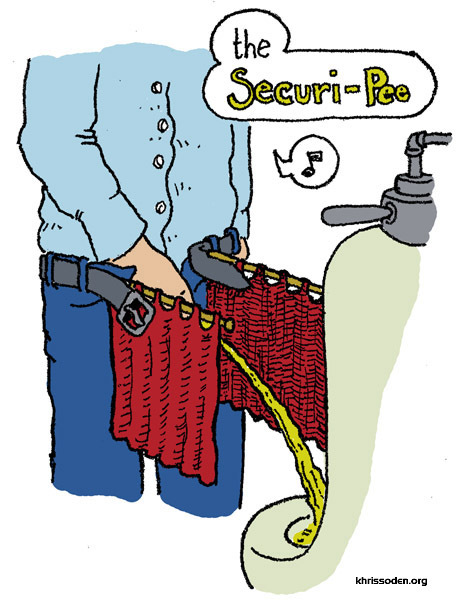 One of the most notable illustrations he did for MoHDI was for the Securi-Pee. Other personal favorites of mine are the Self-Drunk Test Flashcards and the Safe Night-Time Travel for Women. And for the first time I give you a map showing our walk. According to our paths we walked a total of 3478 feet, 1 mile = 5280 feet so we walked .658 of a mile. 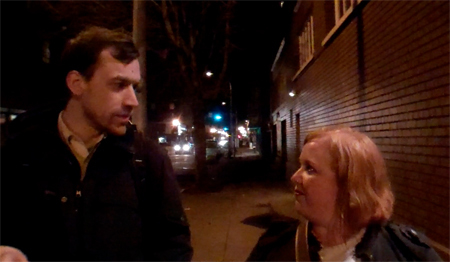 I had a moment to talk with Kristi Lovato before an open mic comedy show at the Brody on Wednesday night. 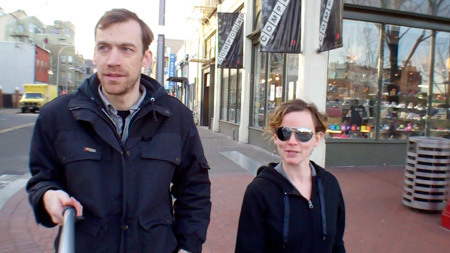 I did three walking talking videos with Nicole, then I learned that I can simply link to a nice playlist of the videos for your viewing pleasure. Enjoy! 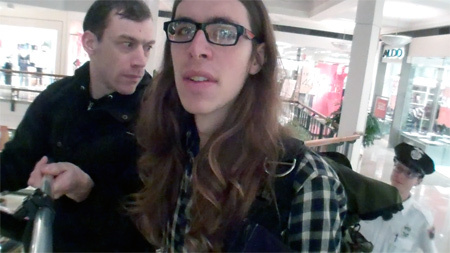 Just before Danny left for Sundance, I was fortunate enough to talk with him. He’s a talented artist who tells some interesting stories and funny jokes. 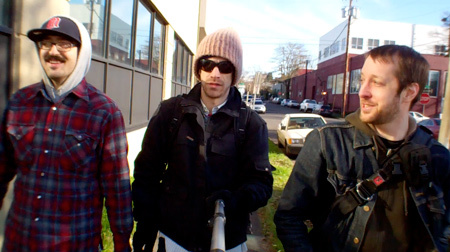 John Mayer, Kristopher Loomis and I walking through SE Portland, Oregon.